The main thrust of the commentary is that there’s a bit of research on children’s use of smartphones and tablets, but not much – and certainly not enough considering the takeup of such devices. The research that has been conducted has mixed results. In some cases, beneficial effects have been demonstrated, for example on improving early literacy skills, or improving academic engagement instudents with autism. In other studies, we see negative outcomes – for example, ebooks that tack on sound effects or games distract children from understanding the actual story they’re reading. So clearly, “more research is needed”. The worry though, is that there are relatively few paediatric guidelines concerning the use of these sorts of devices. So the commentary finishes with some preliminary guidance for parents that includes commonsense claims like “parents should be encouraged to try an app first”. Which is fine, if a little patronising. But still nothing about brain damage. Back in December, the BMJ published an article headed up by Head quarters’own Chris Chambers. The study looked at the association between exaggeration in health-related science news in the media, and the content of the associated academic press releases. Basically, they found that in a large number of cases where exaggeration was present in news stories, it was also present in the press releases. So it makes sense, in our “ipads cause brain damage” case here, to look at whether the source of this scaremongering comes from an overeager press officer. I spoke to Clare Smith, a PhD student at the University of Surrey investigating risk factors for early indicators of language delay. She has also previously bloggedabout similar claims that forward-facing buggies can damage childhood development. 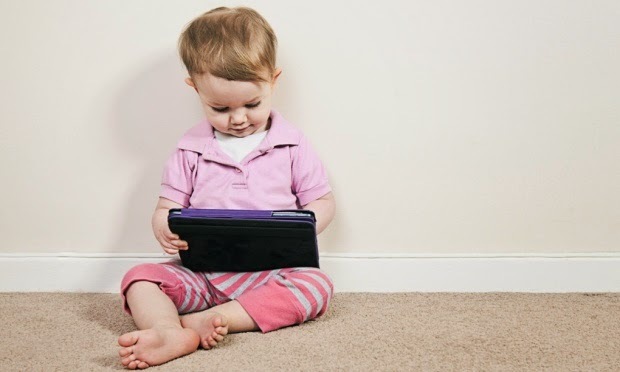 “First, there is no evidence of a detrimental effect on child development from using iPads. The articles that looked at the different learning effects gained from story based apps compared to books do not recommend that iPads are not used, but rather that parents are aware of the different presentations of the story and that they guide the reader accordingly. They are balanced and highlight the potential gains for literacy development to be made from using a range of media” she says. “Second, there is no evidence of use of iPads as a ‘shut up toy’, particularly in the under 3s”, she adds. “The observations I made during my research indicate, if anything, that for this age group the use of tablets and smartphones tends to be a collaborative activity with parents”.